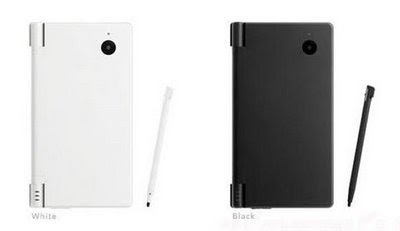 Clouding Around: New Nintendo DSi - Game On! New Nintendo DSi - Game On! Perhaps Wii is doing well but DS was getting long in the tooth. Last night (today, 'pends on where you are), Nintendo graced us with a new DS model that effectively put PSP on the defensive and make sure that it continues to be the primary portable game system to beat, no comers or otherwise. So, what can it do or what features does it have? About 60% longer battery life - Woohoo! 5.3 hours versus 3.25 hours on the old. Kids will be distraced longer in the car. Compatible with DS games but no longer play GB advance games. DSi specific games will not work with DS. You'll see why. Dual Cameras - one on the outside and one on the inside. 3MP on the outside. Wow...vid conferencing during game play? Web Browsing. Also new software allow multimedia play like mp3. To launch in Japan this November for $179. So, how does this affect gaming for mobile warriors? Well, at the moment, DSi ups the ante but we'll have to see how the added cameras will change things. It's natural that Nintendo will incorporate such features. You might be able to argue that DS has just now caught up to the rest of the market, meaning PSP (I still think the iPod Touch needs a bit more time to become (or not) a true mobile gaming platform). Obviously the right direction here for DSi is the added multimedia features. I'm expect Sony and Apple to add cameras to their devices to maintain feature parity. The Touch is the best all around device. It's a mobile platform. It does everything. All it lacks now are tier one games and only time will tell if those games come. Until then, DSi will remain standard bearer. Okay, Sony. You're up next. Joystiq - has a comparison between the new DSi, iPod Touch, and PSP - DSi may still be the game system to beat.